r.lfp - Calculates the longest flow paths for given outlet points using the r.stream.distance addon. r.lfp calculates the longest flow paths for given outlet points and creates a new vector map with those lines. This module requires the r.stream.distance addon. r.lfp creates a longest flow path vector map using a drainage direction raster map and the coordinates of outlet points. The module internally runs r.stream.distance to calculate a flow length downstream raster map and r.path to trace the longest flow path from headwater cells. 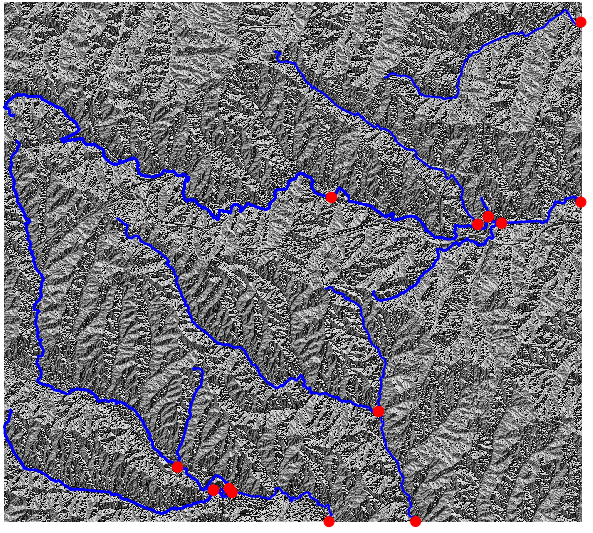 An input drainage map can be created using r.watershed or r.stream.extract. r.lfp can read outlet coordinates from the coordinates and/or outlet parameters. For multiple outlets, the user can assign a unique ID to each longest flow path per outlet point using id, id_column, and outlet_id_column parameters. The id parameter specifies unique IDs for all outlets given in the coordinates parameter in the same order. The outlet_id_column specifies a column in the outlet map that contains unique IDs to be copied over to the id_column column in the output map. These examples use the North Carolina sample dataset. 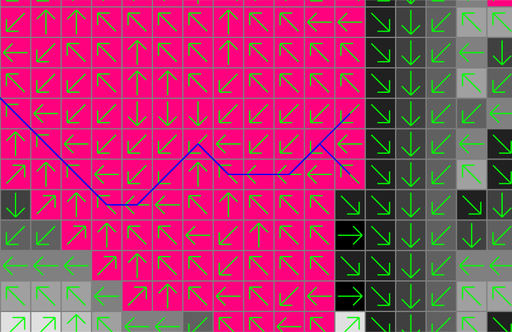 Note that there can be more than one longest flow path when multiple paths have the same flow length. In fact, the above example produces two lines with the same length.